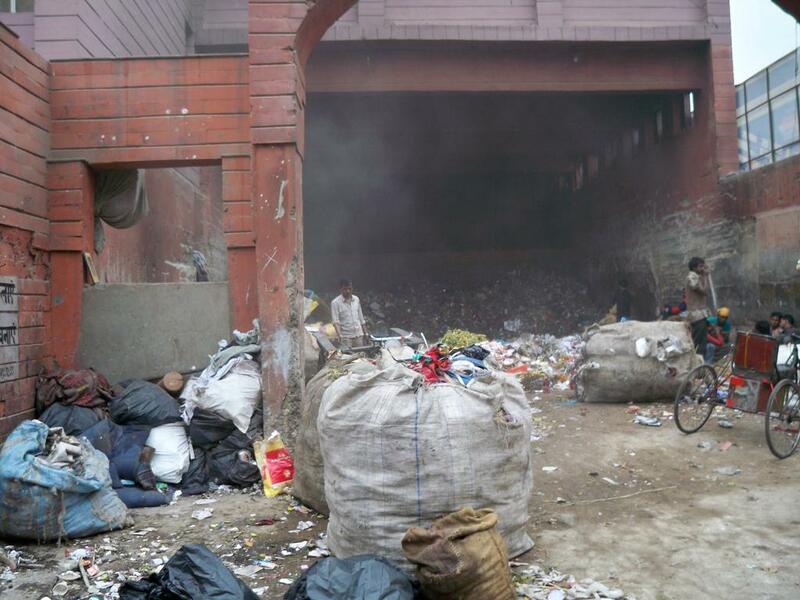 A large amount of garbage accumulated on streets has left the national capital stinking. The reason? An indefinite strike called by its sanitation workers, demanding their salaries which have been due for the past three months. This is the fifth such strike in two years, highlighting the gravity of the financial crisis in the East Delhi Municipal Corporation (EDMC). The cause throughout the years has been constant—lack of funds to pay arrears of workers. EDMC workers claim their dues for November and December have not been cleared. They also demand regularisation of staff and clearance of arrears. “It is the responsibility of the respective municipalities to give the due salaries of the sanitation workers on time,” says Shashi Bhushan, head of All India Kabadi Majdoor Mahasangh (AIKMM). Bhushan further adds that this is not the first time that non-payment of salaries is happening with EDMC workers. “The private companies operating in the companies get tipping fees as per the contract signed between the municipality and company, but so is not the case with sanitation workers. It is violation of their rights,” explains Bhushan. On January 11, a bench headed by National Green Tribunal Chairperson Justice Swatanter Kumar, said sanitation employees’ salaries should be paid on time as it sought a detailed report on budget allocated for their salaries. The bench observed that the "public was suffering due to tussle between government and corporation". Why is urban local management failing? Urban local bodies have limited sources of revenue, the largest being property tax. But most municipalities struggle to assess this, let alone raise the tax quantum. This means that there is huge shortage of money for urban services, including solid waste management. According to “Not in My Backyard: Status of Solid Waste Management in Indian Cities”, a book published by Delhi-based Centre for Science and Environment, municipalities have meagre sources of revenue. A reserve bank report found the total revenue of the municipal sector to be a mere 0.75 per cent of India’s gross domestic product. Similarly, municipal revenue forms a little over two per cent of the combined revenue of the Central and state governments. The bad news, RBI said, is that this revenue was declining. A report by Ministry of Urban Development on infrastructure needs of cities corroborates this. The report found that the revenues from property tax in different states are in the range of 0.16 and 0.24 per cent of the GDP of India. It also found that when all revenue receipts from urban services, including professional and user fees charged by municipalities, were put together, the cost recovery was abysmal. Funds released, but where did they go? As per Delhi government’s record, EDMC received Rs 399 crore in 2012-2013, Rs 416 crore in 2013-2014 and Rs 441 crore in 2014-2015. But in 2015-2016, the fund allocated were Rs. 702 crore and already Rs. 609 crore were released in the financial year 2016-2017. In 2012-13—the first year after the trifurcation of Municipal Corporation of Delhi—the EDMC’s finances were in order. Delhi’s three corporations have admitted receiving 100 per cent of the non-plan funds: Rs 892.92 crore for North MCD, Rs 465.53 crore for East MCD and Rs 830 crore for South MCD, under the non-planned head for the current financial year, which will end on March 31. Around 90 per cent of the non-planned allocation is for payment of salaries, then why have the employees not been paid their salaries and where has all the money gone into despite an increase in fund? On January 9 this year, Delhi government released Rs 119 crore to pay sanitation staff’s salary. Two months' dues were cleared with this money. However, the arrears have not been paid yet. Therefore, few sanitation workers have continued the strike in hope for a permanent solution. The standing committee chairman of the EDMC, Jitendra Chaudhary, informed that a meeting was held with the sanitation workers on January 13 and the strike will be called off soon. When asked if the arrears have been paid to the sanitation workers, he said it will be done once the Delhi government implements the recommendations by Fourth Finance Commission. According to a 2013 Fourth Finance Commission report, 100 per cent entertainment and property taxes, along with 12.5 per cent (against the present 9.5 per cent) of the remaining taxes (including cesses, fees, among others) of the government be put in a “divisible pool”. Half this money would be divided among the three corporations as per population or area; the other half should go to deficient areas, which primarily mean east and north corporations. The commission also recommends a greater share for the Delhi government in the Centre’s taxes—at par with other states—and therefore, its recommendations cannot be implemented selectively but only after agreement between all parties concerned.